Your exhaust is a really important part of your vehicle. It ensures the smooth, quiet running of your car, and helps to maximise fuel economy. 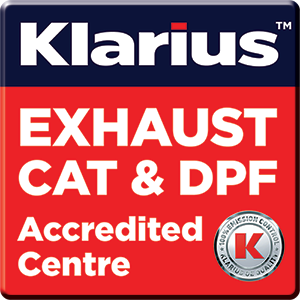 As a Klarius Accredited Exhaust Centre, we only fit the best exhaust systems to ensure that any repair work is done once, and done right - for your complete peace of mind. If your car engine sounds a little noisier and deeper than usual, it may well be a problem with your exhaust. Come and see us and we'll advise the best course of action. As a Klarius Accredited Centre we have access to a range of quality replacement emission control products, from a brand that is known for its performance and reliability. We have a vast amount of experience with fault finding and fitting replacement parts, backed up by the Klarius Emissions team who are constantly researching, developing and improving ever more efficient emission control products that are kinder to the environment. "If your car sounds noisier with a deeper tone, it's likely an issue with your exhaust - don't ignore it and book it in with our technicians"
"Your exhaust system consists of a lot of expensive parts, so ensure you use the best components"